"The Hometown Heroes program began in 2002 as the sole project of the nonprofit Greater Louisville Pride Foundation (GLPF). Although the original intent of the program was to enhance civic pride by installing a jumbo photographic mural honoring Louisville native Muhammad Ali, it quickly expanded to include the recognition of other athletes with strong roots in the community. Today, the Hometown Heroes program has grown to honor a diverse group of famous Louisvillians from a variety of professions – all of whom have inspired others and represented our community to the rest of the world. The giant vinyl banners, some stretching as high as 60 feet, are essentially works of public art and can be found on buildings throughout the Louisville metro area." 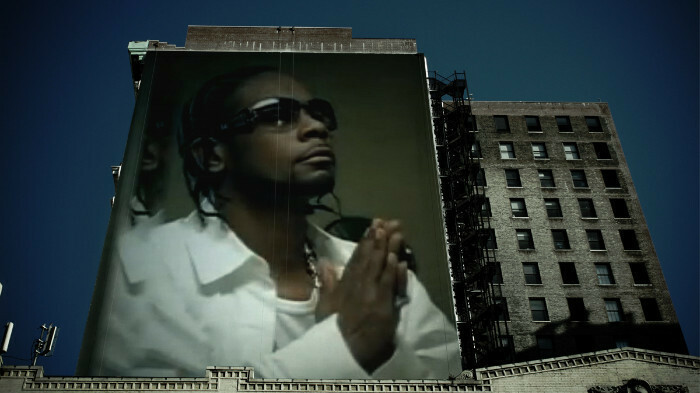 "Stephen “Static/Major” Garrett was born on November 11, 1974 in Louisville K.Y, a place he was proud to call home. He was a singer songwriter and record producer. Static gained posthumous fame for appearing on Lil Wayne's 2008 album “Tha Carter 3” for the song “Lollipop”. He made his breakthrough working with singer Ginuwine. Static wrote the song “Pony” which became a major hit and a milestone in both Static’s and producer Timbaland’s career. He was also a member of the R&B Trio Playa who’s mostly known for their hit single “Cheers 2 U”. For well over a decade Static has been an influential factor in the music industry and continues to have an impact with his musical works. His play on words, harmonizing melodies and keen ear for music lead to the release of some of the industry’s greatest hits such as Aaliyah’s “Rock The Boat”, Ginuwine’s “Pony” and “So Anxious”, and Lil Wayne’s world-renowned “Lollipop”. His profile includes work with artists such as Aaliyah, Timbaland, Missy Elliott, Christina Aguilera, Drake, Rihanna, Nas, Jamie Foxx, Al Green and countless other well-known artists. Static passed at the height of his career on February 25, 2008, due to medical negligence, bringing his life’s work and passion for music to a standstill. To Pay tribute to the legend the fans would like to get Static his own Louisville Own "Hometown Hero" Banner and we need YOUR help. THE MORE SIGNATURES THE BETTER. LET'S DO IT FOR STATIC. HE DESERVES IT. TRULY A UNSUNG LEGEND."